Greetings from sunny Las Vegas, Nevada! This week, I’m on the road, attending the Stansberry Research Conference at the Aria Hotel and Casino. 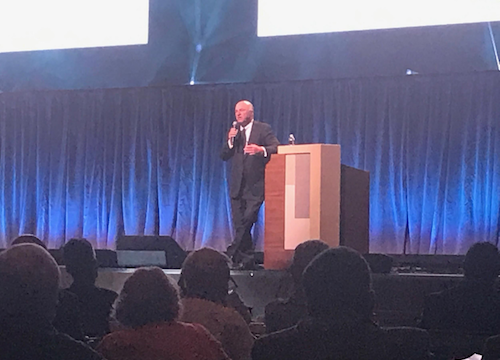 So far the conference has been a great experience, kicked off by a great presentation from Kevin O’Leary from Shark Tank. Kevin has a net worth of more than $400 million and has been a very successful investors in both public and private companies. So when he speaks about how to invest successfully, it’s definitely worth taking notes. Kevin O’Leary is a big proponent of never putting all of your eggs in one basket. Perhaps this is why he is so keen on spending time on the set of Shark Tank… By interviewing dozens of small businesses, he is able to invest in a wide number of different growing companies. That way, if one business doesn’t do well, he never loses a large portion of his wealth. And by investing in many different opportunities, he’s got a bigger chance of hitting a homerun with one of his successful investments. Kevin’s rule of thumb is to never hold more than 5% of your assets in any one position. And while there may be times I would recommend taking a bigger shot at a particularly safe investment opportunity, the 5% rule is definitely a good baseline to follow. All too often, investors think that they’re diversifying their investments, but they’re still putting all of their eggs in one basket. That’s why it is important to find opportunities that are in different areas of the market, and different types of business. It’s a common sense rule, but one that you need to pay special attention to if you’re investing in a handful of similar stock opportunities. Cash is king. There’s just no way around it. If you own shares of Tesla, or Facebook, or many other growth stocks, you might make money as the stock trades higher. But you’re at the mercy of whatever the market (essentially a collection of other investors) believes your investment to be worth. If it falls out of favor, you’ve got nothing. But if you own an investment that pays you cash, you’ve got something… Eventually, the cash is going to pay you back the amount you invested to buy the position in the first place. And that cash can give you an opportunity to invest in other great opportunities as well. The term “fixed income” covers investments that pay a set (or fixed) amount of cash on a regular schedule. Usually, this term refers to bonds, but it can also cover investments like real estate that pay rent on a monthly basis. Unfortunately, while dividend stocks give investors some great yields, there’s no guarantee that the dividend won’t be cut. But fixed income investments have a legal obligation to pay investors a set amount of cash over time. And in the case of bonds, investors are guaranteed to receive their capital back on a set date. When you hear the term “bond” you might think of boring low-return investments. But there are actually some very exciting opportunities in the high-yield space where bonds pay investors a much higher return. We’ve covered many of these opportunities in my Contract Income Alert service — which has developed quite a profitable track record! This is a concept that was drilled into my head by my old boss and mentor at the hedge fund I worked at. And in some form or fashion, I’ve heard this same idea from wealth investors for years and years. When it comes to your hard-earned wealth, it is imperative that you keep the money that you’ve earned, instead of risking too much on a speculative position. That doesn’t mean that every investment will trade higher and none of your positions will ever lose money. But it does mean that you need a margin of safety when it comes to your investments. You should only invest small amounts in high-risk, high-return opportunities. And you should always have a plan for getting out of positions that are trading against you. Great words of wisdom from a legendary investor who continues to grow his wealth and help many small businesses grow to become highly successful ventures. I’ll be back to you tomorrow with more from this great investment conference. And in the meantime, make sure you’re following my twitter feed to see insights that I’ll be posting throughout the event.